Here’s a travel tip... take advantage of one of the the popular Norway in a Nutshell trips. The "Norway in a Nutshell" name is a registered trademark of the Fjord Tours. One thing I remember is all the waterfalls... they were everywhere. I kept thinking that this country just leaks. These tours give you a great taste of all of that Noway has to offer. It's a series of well organized bus, train and ferry connections through Norway's scenic fjord country. The most basic Nutshell trip can take you round trip from Bergen in a day if that's all you have. You leave Bergen early in the morning and take the train to Myrdal. The Bergen Railway is a high altitude one. Be prepared for beautiful windswept mountains, crystal glaciers, shimmering lakes and those waterfalls I talked about. But that all just sets the stage for the Flam Railway. You get off one train in Myrdal and change to another. It's only 12 miles (19 km) but you wind down 2,800 feet (850 m) through even more spectacular scenery to the little village of Flam. In Flam, you will connect with a sightseeing boat for your breathtaking view of the fjords. 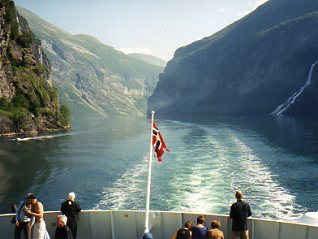 You'll start up the Aurlandsfjord, a narrow arm at the end of the Sognefjord. Just as the waterway seems to be opening up, you will sail into the Naeroyfjord and end your two hour boat ride in Gudvangen. The Sognefjord is Norway's longest and deepest fjord, and possibly its most famous fjord. These two narrow arms are on the most scenic part. In Gudvangen, you'll leave the boat, and you'll take a bus up to Voss, so you can catch a train from Voss back to Bergen. You can make Norway in a Nutshell into a one way trip from Olso to Bergen or the reverse if you'd like. You can also choose to break the journey into two or three days rather than one long one racing from train to boat to bus to train. You could break the journey in Flam and spend a day hiking or visiting the cute nearby village of Aurland. You could use this as a round trip from Oslo and stop for a couple of days to see Bergen. 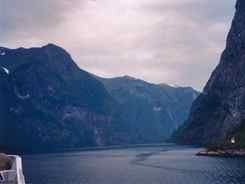 You can combine this with visits to other fjords like the Hardangerfjord or the Geirangerfjord. The Norwegian company Fjord Tours offers many different combinations... and any one of them will let you see Norway in a Nutshell.